What is short about a “short sale”? It is certainly not the time it takes to close…patience is a virtue. A “short sale” is where a home sells for less than the existing mortgage. Therefore, the proceeds fall “short” of paying off the mortgage. Commonly used as an alternative to foreclosure, sellers should consult a Realtor before proceeding down this road. Sellers- Considering a short sale? I have helped homeowners in Raleigh through the short sale process. The process can take several months and the earlier I can get involved helping the seller, the better. To begin with, banks will not approve a short sale just because you owe more on the home than a buyer will pay. The seller must apply for a short sale with their current mortgage holder and show financial hardship. Therefore, one of the most important aspects of the short sale process is putting together a complete short sale package for the mortgage holder. A Realtor who is familiar with short sales can be invaluable to a seller going down this road. If you are considering a short sale in Raleigh, contact me so we can explore your best game plan. 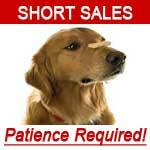 Buyers- Want to buy a short sale? Your patience is about to be tested! A short sale can take up to 6 months and I have heard stories of even longer. Before you venture down this road, a prospective buyer must understand that the bank’s negotiator does not care about your time frames, demands, etc. On my last short sale, the bank did not acknowledge my client’s offer for 45 days. Meaning, the negotiator did not acknowledge, reject, counter or accept…no communication. Often times, a bank will not order an appraisal until they receive an offer and that process alone can take up to 2 weeks. Therefore, there is a lot of “hurry up and wait” times as a buyer of a short sale. Yet, when a short sale is approved to close, the buyer must be ready. If the buyer misses the closing date for any reason, the deal is dead!